Archangels (pronounced ark-angels) are a group of heavenly beings in the Celestial Choir hierarchy. What are the Celestial Choirs? The nine celestial choirs are groups of beings who do God's work and sing his praises. I was surprised to learn that Archangels are just on the second rung of this hierarchical ladder. When I tell you the other choirs you will probably recognize some of them. The celestial choir of Angels are on the first rung of the ladder, then just above them are the Archangels. The third rung is the celestial choir of Principalities, then there is the choir of Virtues. Above them is the celestial choir of Powers and then Dominions. Next is the choir of Thrones and then there are the Cherubim. The highest choir is the Seraphim, who are in the closest proximity to God. It's likely that we hear more about angels than any other choir because their job is to help us, so they are closest to our earthly level. The choir of angels is divided into bands, each with an archangel in charge. As you may have noticed, heaven is very organized, and it won't surprise you to know that heavenly beings all have a specific job to do. Each of these magnificent beings serve on a certain ray (aspect of God). They also have spiritual retreats or homes in the etheric realm (heaven-world) above certain powerful places on earth. Here's a summary of the seven. To learn more about an archangel, click on his name. Michael is the captain of all the angels and archangels. He serves on God's blue ray which is the ray of protection. You can ask him for both physical and spiritual protection. This includes protection from accidents, crime, psychic aggression and even demons. Jophiel serves on the yellow ray of illumination. Why not ask him to help you absorb information when you are studying and when you need wisdom? Chamuel serves on the pink ray of spiritual love. Ask him to help you resolve relationship problems, find a job... and also to locate a lost object! So you could ask him to tell you where your keys are when you are rushing for work. Gabriel is probably the most well known. Christians teach that he told Mary she would give birth to the baby Jesus and Muslims believe he dictated the Qu'ran to Mohamed. He serves on the white ray of purity. Ask him to help you establish discipline and order in your life. Raphael serves on the green ray of divine healing. Ask him for the healing of your body, mind soul and spirit. He is also helpful when you need to have your physical needs met such as food, clothing, shelter and tools of your trade. Uriel serves on the ray of peace. This ray is purple and gold flecked with ruby. Next time you are having a disagreement with someone why not ask him for help in creating a peaceful resolution? Zadkiel serves on the violet ray of forgiveness. Ask him to help you if you are having a problem with this, and also with tolerance and diplomacy. He will help you bring joy back to your life if you ask him. If you're particularly interested in working with these heavenly beings, I highly recommend the book How To Work With Angels by Elizabeth Clare Prophet. It's small and packs in all the essential info in an easy-to-read manner with real life examples. Have angels had an impact in your life? Inspire the world with your true story! Anyway, as you can see, these seven are extremely helpful beings with a variety of skills. I find that when I call to them my day runs more smoothly. Just saying their names out loud will bring them into your life. I call to them three times each in the morning and this sets my day off right. Read true stories of how angels have helped readers like you. You can say a prayer to ask the angels to take you to the etheric retreats for learning while you sleep. I ask that I be charged and recharged with the will of God. And I ask you to: (insert your personal questions or problems). I ask that all information necessary for the fulfillment of my divine plan be released to my outer waking consciousness as it is required. I thank you and I accept it done this hour in full power." *Substitute the names and their retreat locations, found on the pages in this section. If you want to get closer to the angelic hosts you can play their keynote, the classical music piece "Bridal Chorus" from 'Lohengrin' by Wagner. 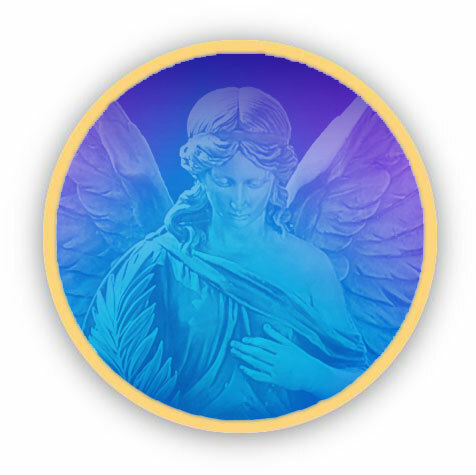 The Summit Lighthouse offers a free online video series featuring detailed information about angels, which I recommend if you'd like to learn more. The series is also available as a podcast on iTunes (link opens within the iTunes program if you have it installed) so you can watch and listen on the go. You'll be fascinated to learn that the wings that are depicted on angels are not, in fact, wings. The high vibration of light surrounding them gives a shimmering effect. They don't have physical bodies and so don't need physical wings to help them fly. Learn about other kinds of divine help in the Spiritual Guides section.